Races page allows to load and edit races and selections. There are a number of actions you can do with races. Load races – opens Load Races page where you can choose races and selections to load, filter markets, etc. Add new – adds one new record to the race list. Thereafter you can choose market and selections there. Import from CSV – opens Import page where races and selections can be loaded from CSV file located on your computer. Export to Excel – saves the race list to Excel file. Runners conditions – opens Runner conditions page where you can edit individual betting conditions for each runner. Races where you want to edit runner conditions must be selected (ticked) in the first column. Manual stakes – opens Manual stakes page where individual stakes for each selection can be entered. Delete selected – deletes races which are selected in the first column. Delete all – deletes all races from the table. Under all buttons you can see a drop-down box and ‘Add’ button. You can type a horse name in the box to find the horse and market where it runs. It is handy when you have a list of horses you want to bet on. Date – date of the race. Market – name and time of Betfair market. The link is clickable, it opens corresponding market on Betfair website. Clicking (SL) link will open the race page on Sporting Life website (if the race is listed on SL). Selections – list of selections for the race (favourites, named runners, etc). More about available selections read on Load Races page. Min odds, Max odds – shows min and max odds conditions for the race (can be set in Edit race form). Rank – shows market rank condition for the race (read more in Edit race reference). Min rnrs, Max rnrs – shows min and max number of runners required for the race (can be set in Edit races form). Race P/L – overall profit/loss made with all placed bets for the race. It shows only if ‘Show race P/L’ box is ticked. 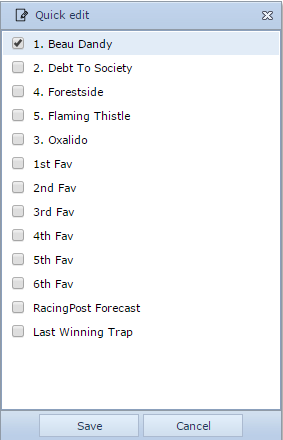 Note that Min odds, Max odds, Rank, Min rnrs and Max rnrs columns are hidden if no one of races has these options set. Under the table it is possible to choose how many races per page should be displayed and whether to show or not the race P/L column. It is possible to change selections by clicking image next to the race. This will open ‘Quick edit’ window. Click ‘Save’ button after changing selections.